fotoShare streamlines your photo booths by taking care of showing off your images to your guests and allowing them to share them. This frees your booth to focus on what it does best, capture photos. 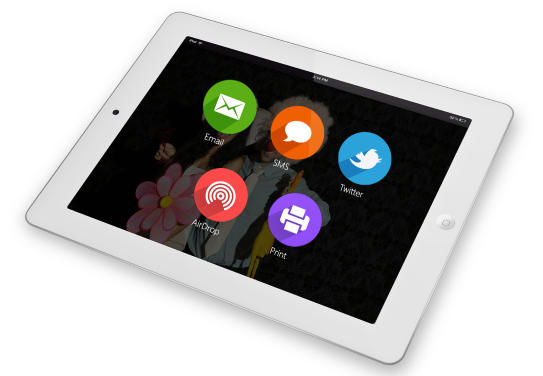 fotoShare allows your guests to share their photos and GIFs in realtime using E-mail, SMS, Twitter, and AirDrop. You get all this without having to worry about complicated setup steps. Start up fotoShare and start sharing right away without any setup. E-mails and SMS will be queued if you don't have internet access at your event. The fotoshare app works automatically with dslrBooth Photo Booth Software for Windows and Mac and LumaBooth for iPad to download your photos in real-time and showcase them to your customers. If your printer supports it, you can even print directly from your iPad using AirPrint or your professional printer attached to dslrBooth. App is free to try. If you like it, sign up for a monthly subscription for a few dollars a month and cancel whenever you want. Requires $7.99 monthly or $79.99 annual subscription which includes unlimited e-mail and sms sharing.